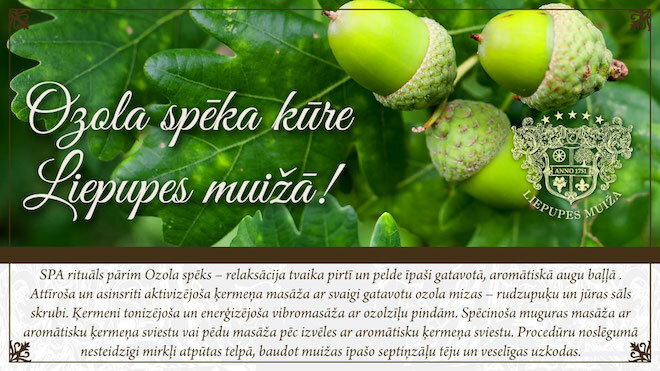 Irreplaceable part of cleanse process is our steaming in aromatic sauna (60 min), afterwards invigorating and cleansing body massage with freshly made oak bark - honey scrub (20 min) and acorns pinds. After treatments we offer you to enjoy the lime blossom tea of Liepupe Manor and healthy snacks in our recreation room. Body tonic. and energetic vibro massage with acorn pinds (10 min). Fortifying back massage with aromatic body butter or foot massage (30 min). SPA procedure visit time should be previously aligned.